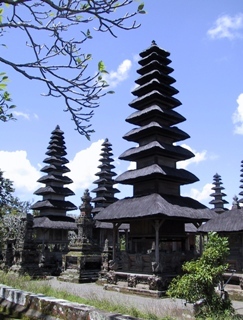 Visit one of the most beautiful temples in Bali, Pura Taman Ayun, near the village of Mengwi, South Bali. Enjoy every single detailed of the Merus or just enjoy the beautiful surrounded garden. So the summarized of all them become the beautiful temple garden. This royal temple is one of the most important also the most attractive one of Bali. That’s not really surprising why this temple such a lovely attraction for the people, if you see the surrounding where the temple located, it said enough. The complex stand on an island in a river with beautiful park and ponds, surrounded by moat. Because of the location, it gives a fresh and natural appeal. I could spend all day in this magnificent surrounding without getting boring. It’s too beautiful to get bored and there is so much to see and to discover. The temple was built by Raja of Mengwi, I Gusti Agung Putu. The special place to honor the important Hindu Gods. The temple is bordered by broad canals and it can only be entered through a bridge leading to the gate named Candi Bentar. At the entrance, you’ll find a large fountain beyond the split gate. This fountain is dedicated to the rulers of the underworld. Through the gate you will enter the innermost courtyard with no more than 27 buildings with varying size and function. And you’ll also find the park with fountain that has nine water jets, which one in the center, dedicated to Dewa Nawa Sanga, the nine main gods of Hindu. The temple holds every 210 days of Balinese calendar (Pawukon) the day of Odalan, called Anggara Kasih. And it’s always interesting to see the ceremony with so much color and lovely decoration. Located about 8 km Southwest Ubud and about 18 km northwest Denpasar, near the village of Mengwi. Make it easy to reach, and a perfect distance to make a day out.